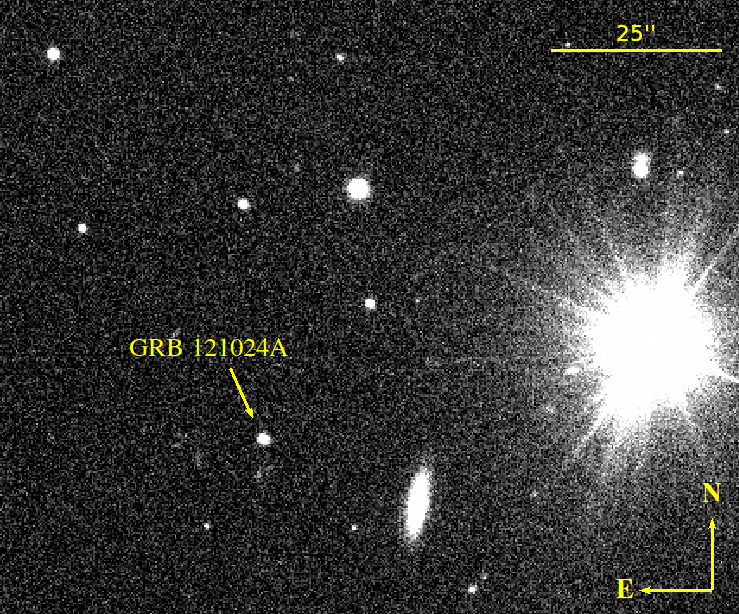 An image of the Gamma-ray Burst taken with the VLT. Gamma-ray burst 121024A, as seen on the day of burst by ESO’s Very Large Telescope (VLT) in Chile. Only a week later the source had faded completely. Credit: Dr Klaas Wiersema, University of Leicester, UK and Dr Peter Curran, ICRAR. For the first time an international team of astronomers has measured circular polarisation in the bright flash of light from a dying star collapsing to a black hole, giving insight into an event that happened almost 11 billion years ago. Dr Peter Curran from the Curtin University node of the International Centre for Radio Astronomy Research (ICRAR) was part of the team that observed Gamma-ray Burst 121024A – a bright flash of light emitted by a dying star collapsing to a black hole – and found a surprising detail in the light they collected. The research was published today in the prestigious journal Nature. 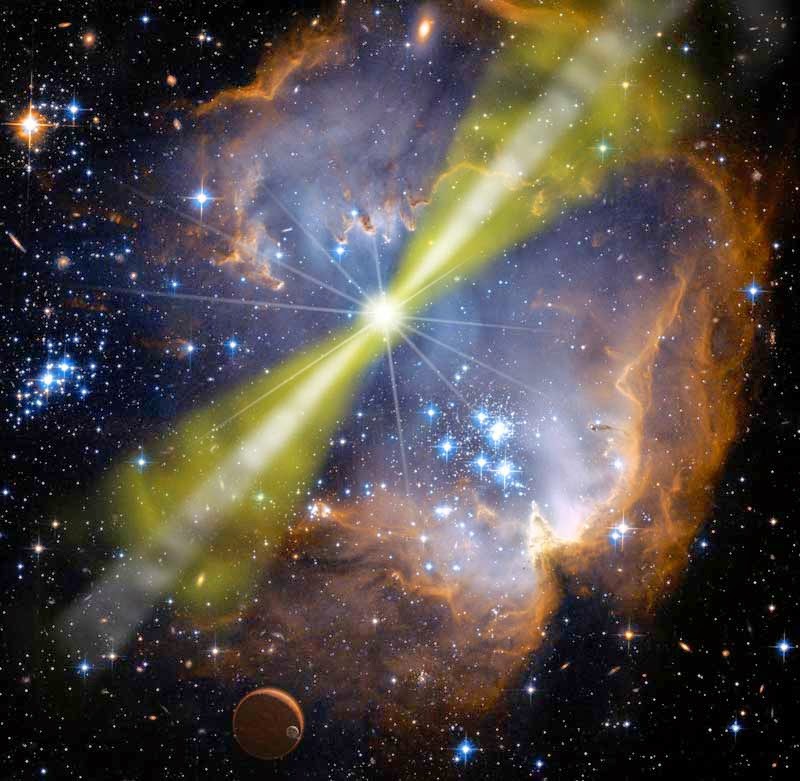 “Gamma-ray Bursts are so powerful that we can see them clearly at extraordinary distances,” Dr Curran said. If light is polarised it means the waves are moving in a uniform way as they travel – either bouncing up and down or left and right for linear polarisation, or in the case of circular polarisation, corkscrewing around in a spiral motion. Dr Curran said 3D movies make use of circular polarisation by feeding a different image to each eye through special glasses, giving the illusion of depth while watching a film. “Most light in the natural world is unpolarised, the waves are bouncing around at random,” he said. “But the light from this Gamma-ray Burst looked like it was part of a 3D movie – it was about 1000 times more polarised than we expected. “This means that the assumptions we’ve been making about Gamma-ray Bursts need to be completely reconsidered – assumptions of how electrons are accelerated to the incredible speeds we observe. “Our results show that Gamma-ray Bursts are far more complex than we thought.”Gamma-ray Bursts are the brightest objects in the entire Universe, only lasting a fraction of a second, but sending out as much energy in that time as the Sun will in its entire life. An artist’s impression of a Gamma-ray Burst, showing the two intense beams of relativistic matter emitted by the black hole. To be visible from Earth, the beams from the Gamma-ray Burst must be pointing directly towards us. Credit: NASA/Swift/Mary Pat Hrybyk-Keith and John Jones. Click for largest version. These bursts are emitted by dying stars collapsing to black holes that form jets of material travelling at over 99.995 per cent of the speed of light. “These extreme objects are like super-powered versions of the world’s largest and most powerful particle accelerator, the Large Hadron Collider, except very far away in space,” Dr Curran said. “We can use them to study microscopic electrons and how they behave in extreme environments, at a great distance – in this case, 18,500 million light years away, at a time when the Universe was just a fraction of its current age.